On April 29, 2017, Kayode was a passenger in a car going through an intersection in Brooklyn, New York. He was leaning up against the window when another car (that later claimed to be blinded by the sun) ran a red light and struck Kayode’s vehicle! This resulted in a three-way collision since the vehicle Kayode was in lost control and struck another car. The vehicle Kayode was in was hit so bad that it resulted in serious injuries to his head, back, shoulder and right hand. He was taken by ambulance to the hospital and was discharged later that day. Remembering that day, Kayode is sure that if it weren’t for the airbags deploying, he may not be alive today. Kayode sustained a concussion and suffered with post-traumatic headaches. He also experienced weakness in his right hand and fingers; moreover, Kayode also suffered a right shoulder and a right-side rib contusion. His treatment plan involved extensive physical therapy and acupuncture. Kayode received multiple trigger point injections to the cervical and thoracic musculature in his back. These injuries were especially troubling since Kayode works as a professional drummer. Due to the injuries, he could not play for over a year! Another lawyer recommended Kayode to contact The Case Handler team. At first, Kayode was not sure which lawyer would be the best choice for him. After all, injured victims only have one-shot to obtain the optimal compensation in a bodily injury claim. Thanks to the recommendation, he called The Case Handler team and spoke with Ava, a paralegal to Adam Handler. Kayode was very impressed with his legal representation. 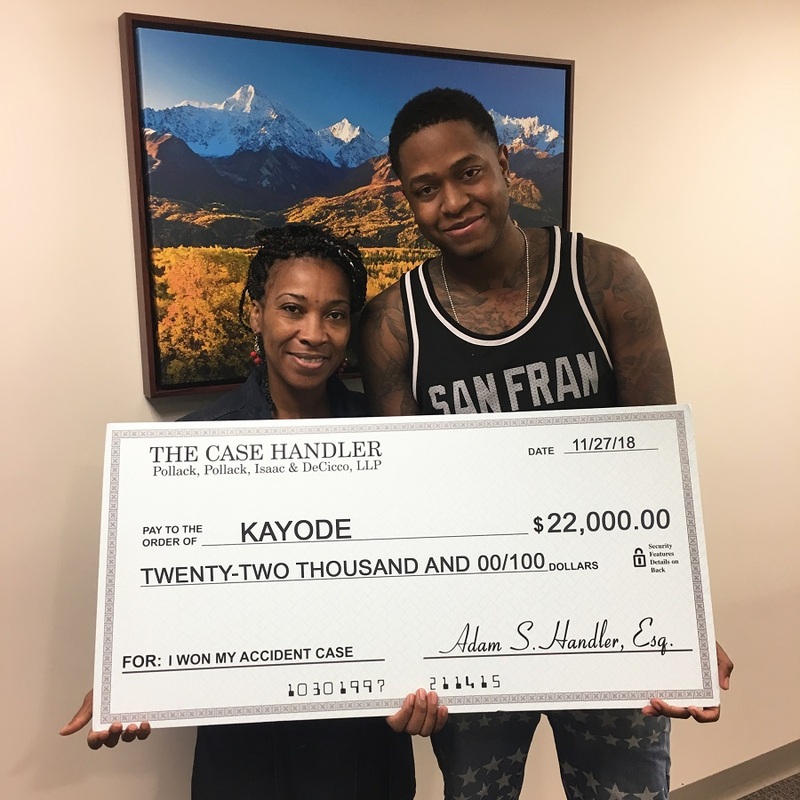 He had a team that was, “There for me.” Thanks to Kayode’s trust in The Case Handler team, we handled all of his medical bills and successfully recovered a $22,000.00 settlement for him! In an instant, a car accident can completely change a person’s life. Thankfully, Kayode was able to continue his passion as a drummer after a year of treatment and recovery, but that is not always the case for injured victims. An unsuspecting accident is unavoidable in most cases. The Case Handler team has years of experience knowing how to handle the unexpected. There is only one shot to obtain compensation for your injury. Make sure you hire the right legal team that will fight the hardest for you to obtain the most for your case.